January 16, 2017 By Claire Davidson & filed under Blog. When you’re looking to start a new fitness plan or get back in shape, you usually have the best of intentions. Your motivation is high and your plans are grand: to start working out every day, burning tons of calories and building muscle in the process. However, even the best-laid plans go awry. And that motivation you have at the start of your fitness plan or weight loss journey can slowly start to wane when you get bored with what you’re doing or run out of ideas. Luckily, there’s a solution that can hold you accountable, help you push past plateaus, and keep you on your toes. And no, we’re not talking about expensive programs or personal trainers. Behold: the humble workout calendar. Workout calendars are typically 21 to 31 day calendars you follow that tell you specific workouts to do each day. They’re designed for specific needs or fitness levels. For example, at Get Healthy U TV we have program calendars and combination calendars. A program calendar is modeled after one of our specific workout programs, like our HIIT Calendar. A combination calendar utilizes several different programs to give you specific results, like in our Ultimate Abs Calendar, or our Get Started Calendar for beginners who want to get back on track. Workout calendars are one of the BEST resources out there to keep you on track and keep challenging your body. 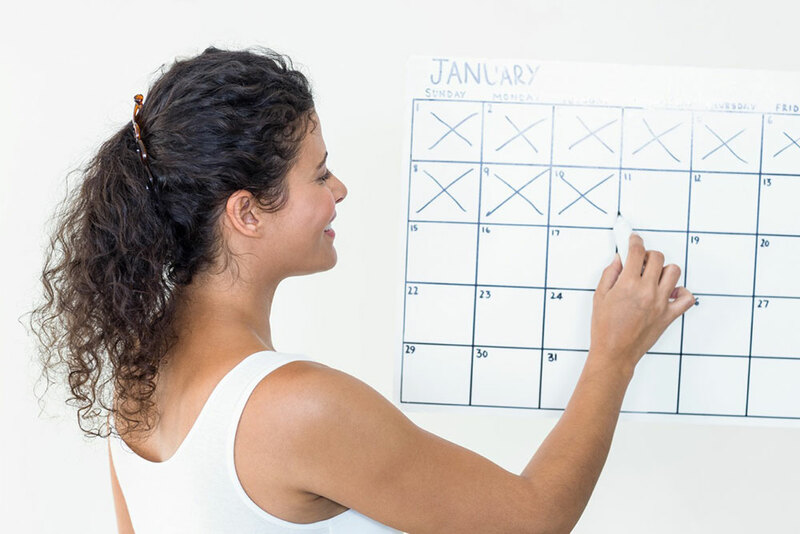 Here are four reasons why following a workout calendar will give you better results. When you want to get in shape or lose weight, one of the biggest struggles is accountability. It can be so easy to get off track when you’re traveling, not feeling your best, or when life gets super busy. But a workout calendar provides you with a clear-cut plan for daily success that’s written down and more serious. You’re no longer on your own, in the dark, struggling to stay motivated and know what kinds of workouts you should be doing to see results. Your calendar provides you with an exact plan for getting in shape, and tells you to show up every day to do it! When you do the same thing every day, your body gets used to it. If you’re just doing steady state cardio every day for 20 minutes, you won’t likely see any change in your body. Luckily, workout calendars mix it up by providing plenty of variety in your workouts each day. This challenges your body and keeps your muscles guessing, so you work different areas and keep your metabolism fired up. With a workout calendar, you won’t end up doing the same old thing every day, and because of that your muscles will stay challenged and your metabolism will be revved into high gear. When you have an automatic plan in place, it’s easier to enlist a friend to join along with you! Encourage a little friendly competition by checking in with each other to see if you’ve done that day’s workouts. Following a workout calendar with a friend is much easier than making tentative plans to run or attend a spin class; this is a way for you BOTH to commit to a month’s worth of workouts and push each other to be your very best. Perhaps one of the best things about workout calendars is that they are for a set period of time. Without an “end date” it can be hard to know what you’re working towards. With workout calendars, you can see the light at the end of the tunnel and it gives you something to work towards. And when you’re done with one month-long workout calendar you can mix it up and go on to the next one! If you’d like to try a workout calendar, here are just a few of our favorites! For a complete list of workout calendars, click here. Bodyweight Fusion: A calendar that includes only bodyweight workouts—so you can do any of them wherever, whenever—without equipment! Metabolic Reboot: A calendar based off of our Metabolic Reboot Program! You’ll restart your metabolism with these calorie-burning, fat-torching workouts.